It always begins with a brave individual making the hard choice to ASK for help. Or, maybe it's just the smart and savvy marketer looking for good leads. Whatever it is, let us help you find the right attorney, marketing professional, data wizard, or branding consultant for the job. Our job is to help you get what you need. 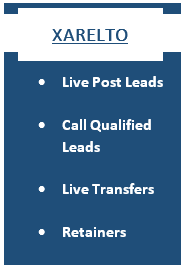 Need LEADS? You've come to the right place for: Xarelto, SSD, Mirena, SSRI, Auto PI, and Benicar. Other leads are available upon request, and we're continuously adding to our portfolio. national campaign kicking off. major jurisdictions. If you're looking for pricing information for the above listed leads, you'll need to ask for access to our secured pricing page, email us at: Hello (at) EWblue (dot) com, or click on the image above and enter your information on our "Contact Us" page with your details. We've all heard the TV commercials say in booming, baritone voice, "When injured, maltreated, or fighting giants with the cards stacked against you, it's nice to know that you have an attorney on your side!" Well, when the law firm or advocacy group needs their own Calvary to charge in to save the day, WE'RE the cats that send them! We're sort of like the cowboys behind the cowboys.